I'm so excited......I entered a Hallowe'en Costume Challenge and I won!!! 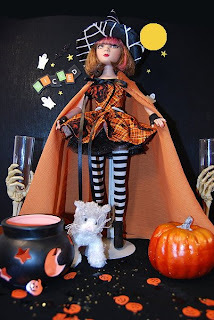 I designed the outfit and dressed Prudence Moody as the cutest little Hallowe'en witch with her cat Esmerelda. They were the Notsowicked Witch and her Notsoblack Cat. Congratulations Larraine... deservedly so!!!! LOVE IT!! !